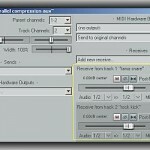 Tags: Audio mixing equipment, Using reverb effects in mixing. 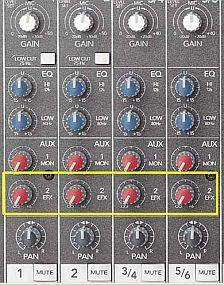 This is a tutorial for complete beginners in using a reverb hardware unit in your mixing console. 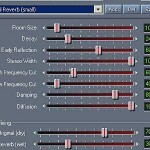 This post talks about the concepts of using reverb unit, setting the dry and wet signals in the mix and adjusting the desired reverb in the mix. The standard connection of reverb to a mixer is using parallel connection in the screenshot below (this is connected after fader or post fader). 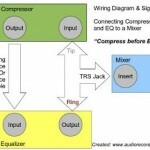 Read this tutorial if you are not familiar about post fader and pre-fader in audio mixer. The aux in 1 and 2 (stereo) is connected to the reverb unit inputs 1 and 2 (stereo). 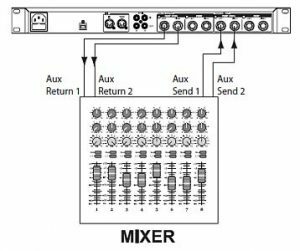 And then the output is connected back to the mixing console aux returns 1 and 2. In some mixers or reverb units, it is common to have one aux send input (EFX) (also known as mono input) to be sent to the reverb unit and then the stereo outputs of the reverb are then connected back to the stereo aux returns 1 and 2. When the reverb unit is connected in parallel, you will be dealing with its dry and wet signal. 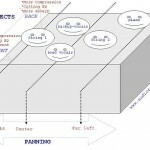 The dry signal is defined as the signal without an effect applied on it. This is also known as the “unprocessed signal”. So the signal from the mixer aux input is still dry because it is not yet implemented with reverb. 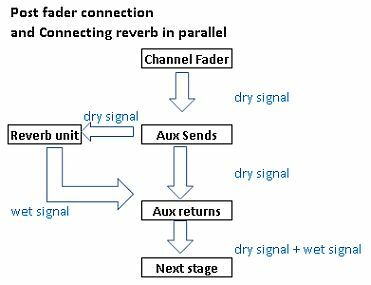 However the signal at reverb outputs which are connected to aux return is termed as “wet” because they are already processed with reverb. Based on the signal flow diagram above, the reverb output which is now “wet” (because this signal is processed with reverb) is combined with the “dry” signal of the mix. The reverb input which is coming from the aux sends is still unprocessed or dry.